Quiet workhorse. A powerful Core i5 processor combined with a matte display and a 1 TB hard drive; theoretically, these features should make the Lenovo B580 a workhorse for the office. Whether or not this notebook can justifiably be allocated to this category will be revealed by our review. 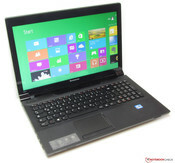 Lenovo have been providing affordable notebooks (between 300 and 600 Euros/~$388 and $776) for private and business customers in the B series for several years now. While the chassis' of the individual models are very similar, there are nevertheless differences. We have for instance already previously reviewed two other representatives from the series; the Lenovo B590 (Core i3-3110M, HD Graphics 4000) and the Lenovo B570e (Pentium B960, HD Graphics), each of which fared quite well despite their low prices. 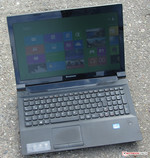 Whether the Lenovo B580 is on a par with its siblings will be determined during our review. In order to put the results of our tests into perspective, we have used the HP ProBook 4545s (AMD A4-4300M, Radeon HD 7420G) and the Lenovo ThinkPad Edge E530 (Core i5-2450M, GeForce GT 630M) for the sake of comparison. 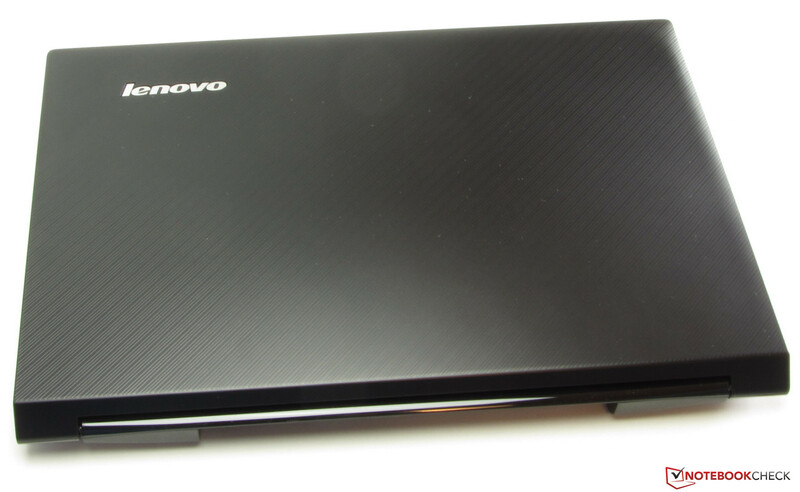 The case of the B580 is practically identical to that of the Lenovo B590, whereby the differences are merely of a visual nature. Also, the relation to the B570, the B570e and the B575e are obvious, although they are certainly more pronounced in these cases. The case of the B580 is primarily composed of matte black plastic, and merely the display frame and the area between hinges have a glossy surface, while the back of the display is covered with a fine pattern. In the case of the B590 on the other hand, the aforementioned elements also have a matte black surface. 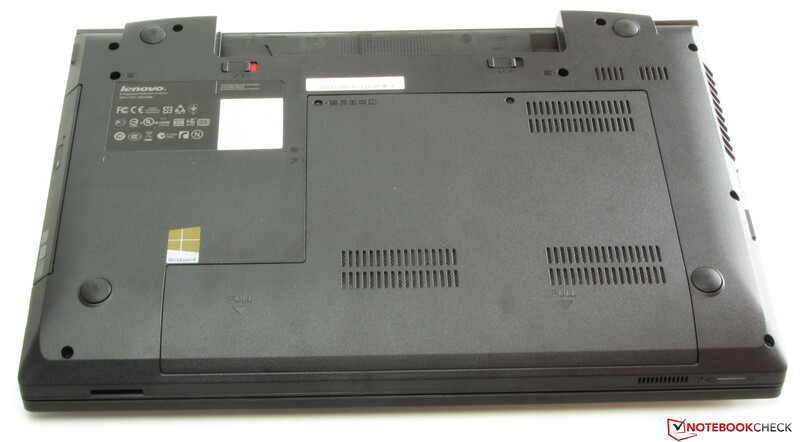 The ThinkPad Edge E530 meanwhile is also composed of matte black plastic, while only the HP ProBook 4545s is able to improve on the others with the back of the display, the palm resting area, and the speaker mesh being composed of aluminum. The stability of the case is decent for this price range, although it could be better overall. For instance when applying some pressure to the front the base unit dents inwards, or when applying pressure to the edge on the left next to the keyboard the right front corner of the base unit lifts upwards. The base unit could also be a bit more rigid, since it can be warped visibly with a small amount of force. 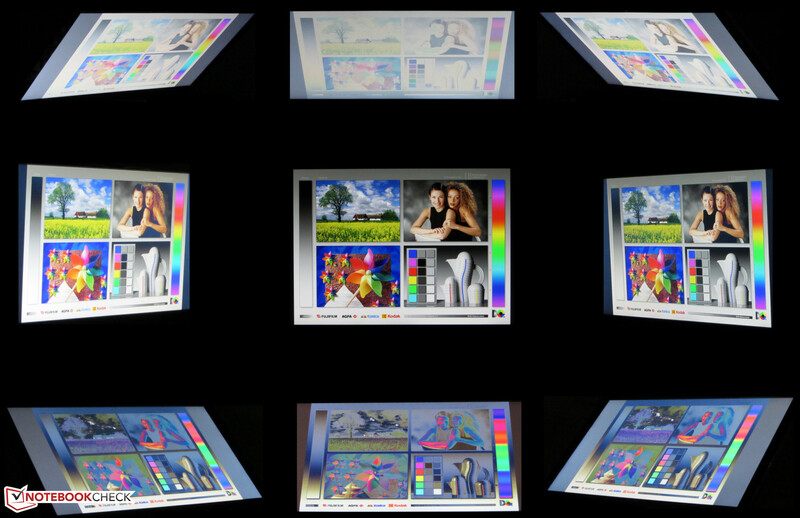 This is something that also applies to the display, particularly in the middle, where pressure applied to the back of the display leads to denting inwards and changes to the displayed images. The hinges meanwhile hold the display in place, although they do allow some wobbling. Opening the display with one hand is possible. There is a maintenance panel. The back of the display is covered with a fine pattern. Completely black - the B580. In terms of the interfaces, the three notebook counterparts are more or less identical. Along with the usual contemporary array of available options, the only exception are the number of USB ports (B580 and ProBook = 4, ThinkPad = 3). All three provide two USB 3.0 ports. Altogether, the location of the interfaces on the B580 is not ideal, since they are primarily distributed along both sides towards the front. There is a card reader at the front (SD, MMC, Memory Stick, Memory Stick Pro, xD). Right: Audio combination, USB 2.0, DVD burner, USB 2.0, power input. Left: Socket for a Kensington Lock, VGA output, Gigabit Ethernet, HDMI, 2x USB 3.0. Wireless communications are handled by a WLAN module from Broadcom, which supports the standards 802.11 b/g/n, and did not show any problems during our tests. Regardless of whether the distance to the wireless router was very close (approx. 3 meters/~10 feet) or two stories lower (reception: 50%), the connection never failed. During our test, we did however observe occasional interruptions in the Internet connection (not the connection between the router and the notebook). Other notebooks that were connected to the router via WLAN did not depict this behavior. As far as Gigabit Ethernet is concerned Lenovo have opted for a representative from the popular Realtek RTL8168/8111 family. Also included is a Bluetooth 4.0 module, and a webcam (0.3 megapixels) that creates slightly coarse images with a resolution of 1280x720 pixels. 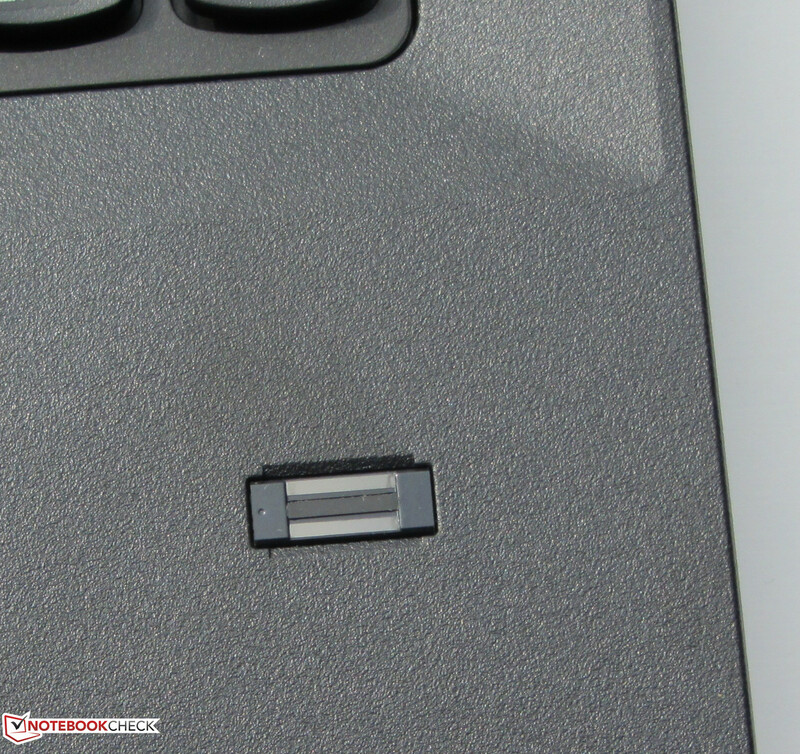 Along with the Kensington Lock attachment for the physical protection of the notebook, there is also a fingerprint reader included. With the latter of these, it is possible to restrict access to the system together with the preinstalled software Authentic TrueSuite. The USB ports on the notebook can meanwhile also be blocked with the likewise preinstalled collection of tools Solutions for Small Business, such that no data can for instance be copied to a USB drive. The only thing included with the delivery is a poster with information relating to security, the warranty, and instructions for configuring the B580. The notebook comes with Windows 8 (64-bit) preinstalled, although a Windows 8 DVD is not included. The Windows 8 recovery system can be called upon by simply pressing and holding down the F11 button during the boot up process, and allows Windows 8 to be repaired or to be restored to its original state, for example in cases when the operating system fails and ceases to work. Changing the operating system to Windows 7 would not be a big deal, since all the necessary drivers can be found on the Lenovo website. Even Windows XP, which is still quite important for businesses these days, is supported as far as possible with the provision of the appropriate drivers. 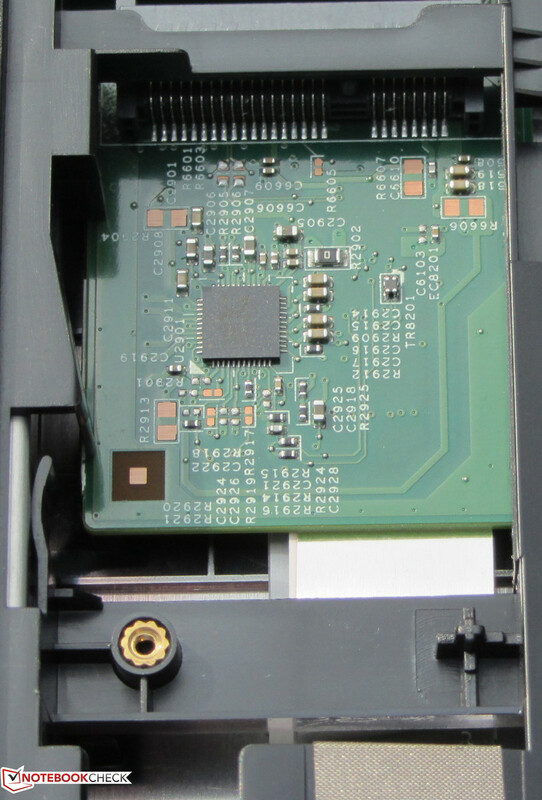 Once the maintenance panel has been removed access to the hard drive, RAM, WLAN module and the BIOS battery is possible, while the cooling fan is at least partially accessible. The B580 has two RAM slots, one of which is fitted with a four GB module, but can support up to a maximum of eight GBs of RAM according to the manufacturer. 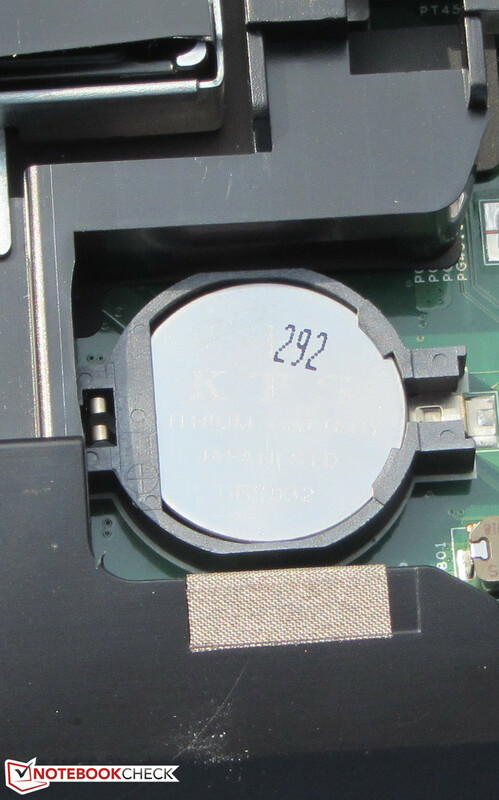 Swapping the hard drive was possible without any difficulties, whereby any standard 2.5-inch drive should be compatible (7 and 9.5 mm thick models). 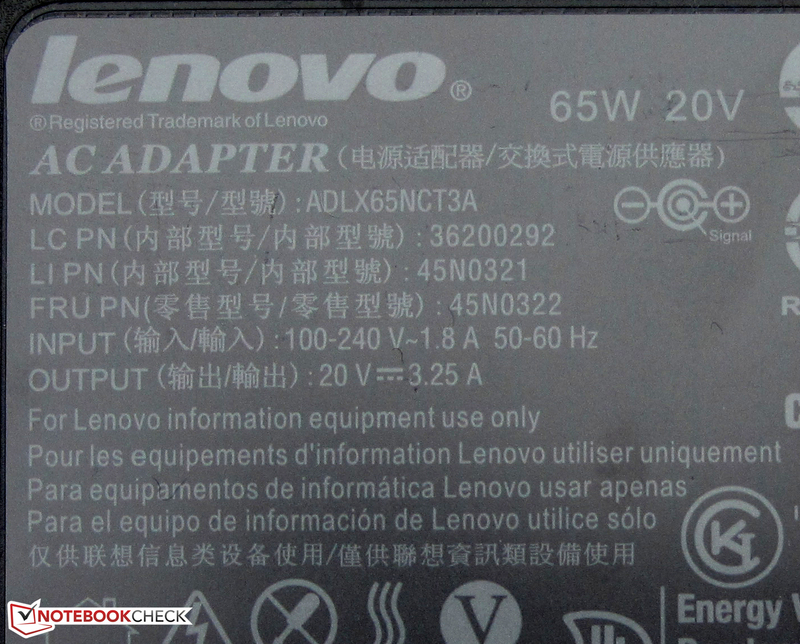 Lenovo have additionally included an mSATA socket with the B580, such that a corresponding Solid State Drive could also be integrated into the notebook without having to forgo the existing hard drive. In principle, it should also be possible to use an appropriate SSD as a cache, in which case capacities between 16 and 32 GBs would be interesting. The appropriate software (ExpressCache) is provided by Lenovo on their website. Even if the B580 is not explicitly named as a compatible model, it should nevertheless still work. 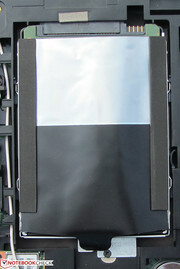 mSATA SSDs with a capacity of 16 GBs are currently available starting from under 30 Euros (~$39). 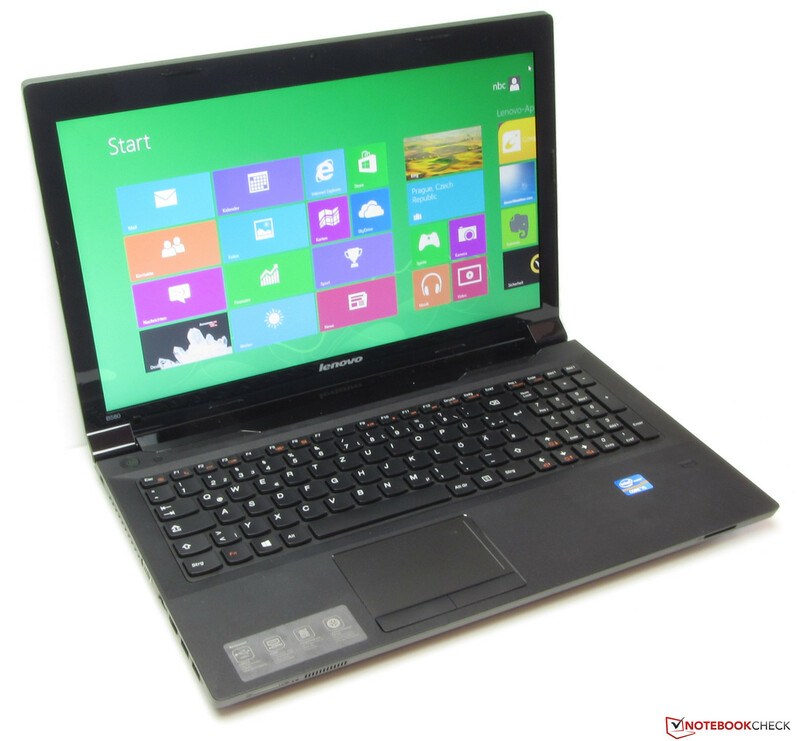 The B580 is provided with a 12-month Bring-In warranty, in which case the owners of the notebook would have to send it to Lenovo if there is a problem. 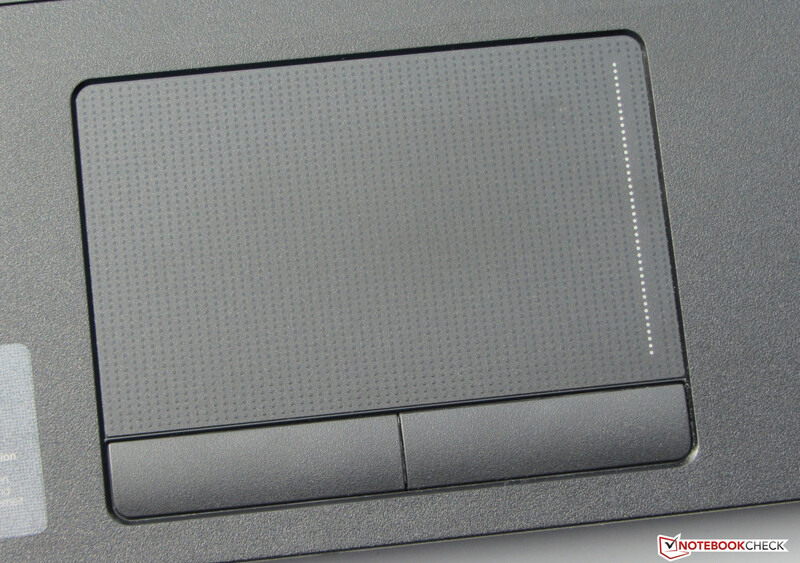 The ThinkPad Edge and the ProBook meanwhile are the same in this respect. In cases when buyers require a longer warranty period, it is possible to extend the duration to either two or three years, whereby this would incur an additional expense of 30 or 70 Euros (~$39 or $91) respectively. Both of these warranty extensions can also be bought together with Accidental Damage Protection, which also protects against damage resulting from such things as spilt liquids. In this case the extra cost would be either 65 or 115 Euros (~$64 or $149). 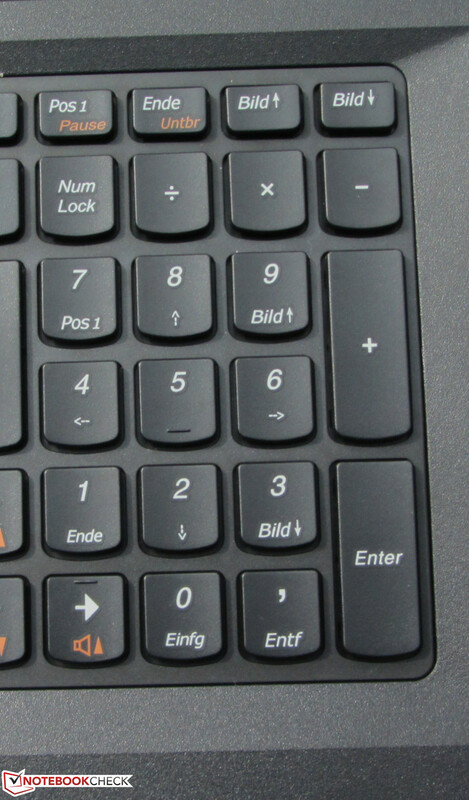 The B580 is equipped with the typical Lenovo AccuType keyboard, which can be found in many Lenovo notebooks, whereby the concave keys have a medium length key travel and a clearly recognizable pressure point. In addition, the key resistance is very pleasant and is not too soft or too hard. While typing the keyboard bends inwards marginally in the middle though this is not really much of a drawback. Overall, the typing is pleasant. 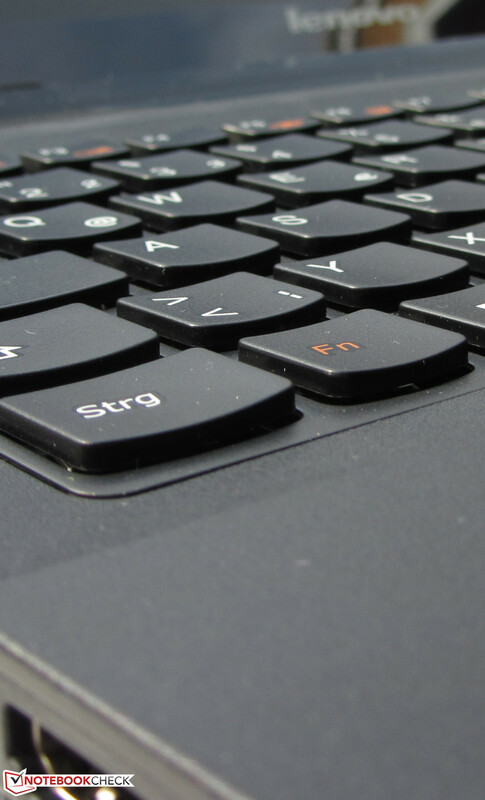 Aspects that could take some getting used to are the locations of the Enter, Backspace and right Shift keys, which are unusually small and can easily be slightly missed without the necessary practice. 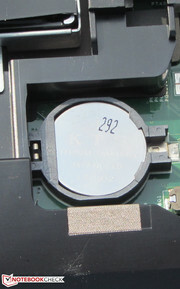 As the mouse replacement, a conventional multi-touch capable touchpad with dimensions of 5.7 x 9.2 centimeters (~2.2 x 3.6 inches) is provided. 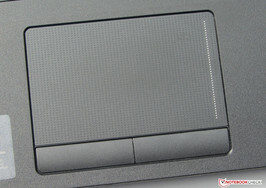 The surface of the touchpad is covered with tiny bumps that do not affect the gliding properties adversely. A diverse assortment of multi-touch gestures are supported, which can be individually switched on or off via a configuration menu. 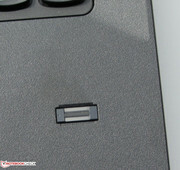 The two mouse buttons have a short key travel and a clearly audible and recognizable pressure point. 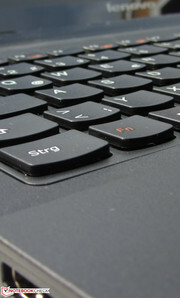 The typical Lenovo AccuType keyboard. 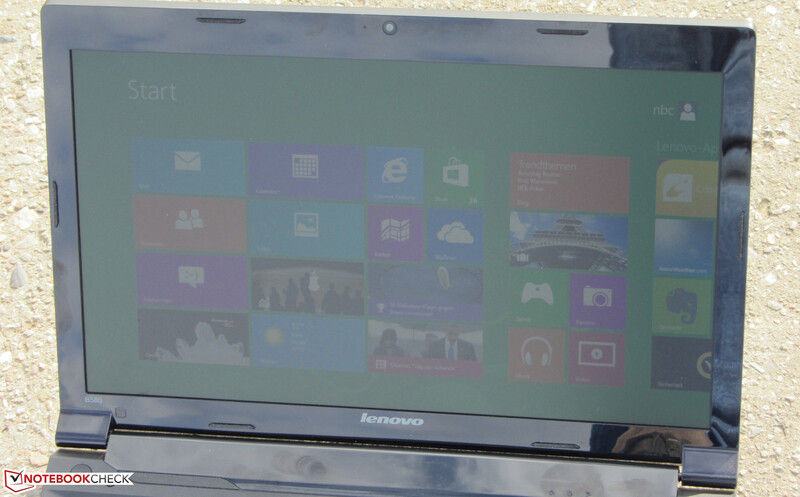 Lenovo have equipped the B580 with a matte 15.6-inch display that has a native resolution of 1366x768 pixels. Other display types are not available to choose from. 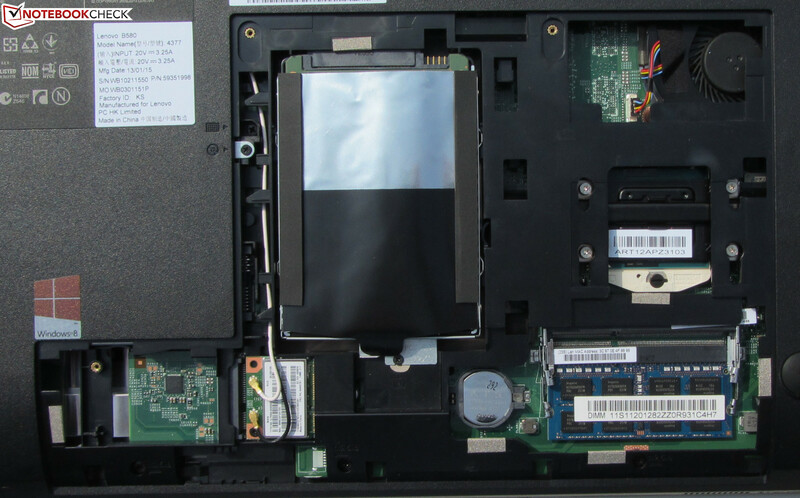 The average brightness of the display lies in the mid-range with 204 cd/m², while the display of the ProBook is marginally darker with 180.7 cd/m², and the ThinkPad Edge provides somewhat brighter images than its competitors with 224.2 cd/m². In terms of the contrast (555:1) and the black level (0.38 cd/m²), the display of the B580 delivers quite decent values, although it is not able to cover the AdobeRGB or the sRGB color spaces. The ProBook (367:1, 0.54 cd/m²) meanwhile does not fare quite as well, while the ThinkPad Edge (122:1, 2.01 cd/m²) could almost be described as catastrophic. We measured the display with its default settings (target color space sRGB), and were able to determine obvious Delta-E 2000 discrepancies when it came to the grayscale and cyan. In the cases of the colors red, blue, magenta and yellow, the deviation was more moderate (Delta-E between 5 and 8). Only green and white are within the targeted range (Delta-E smaller than 5). As a result of these characteristics the display has a blue tint. The low display brightness while battery powered (155 cd/m²) makes using the notebook outdoors difficult, although it is not entirely impossible thanks to the matte display surface and its reasonably good contrast ratio. When it comes to the viewing angles we did not discover any surprises. 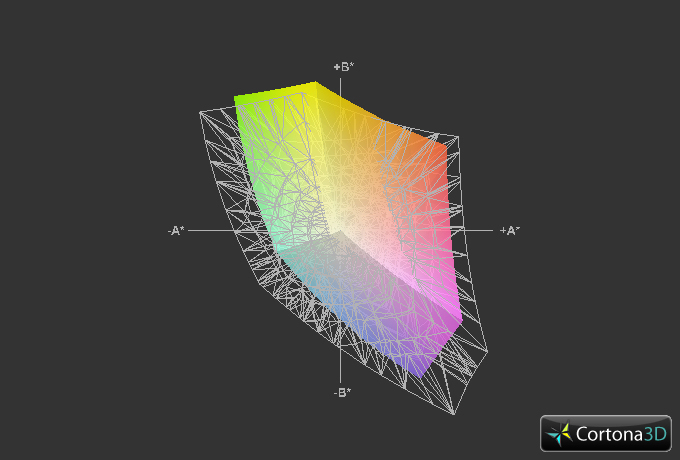 Changing the viewing angle vertically quickly led to the images on the display changing. Horizontally the viewing angles are considerably wider. 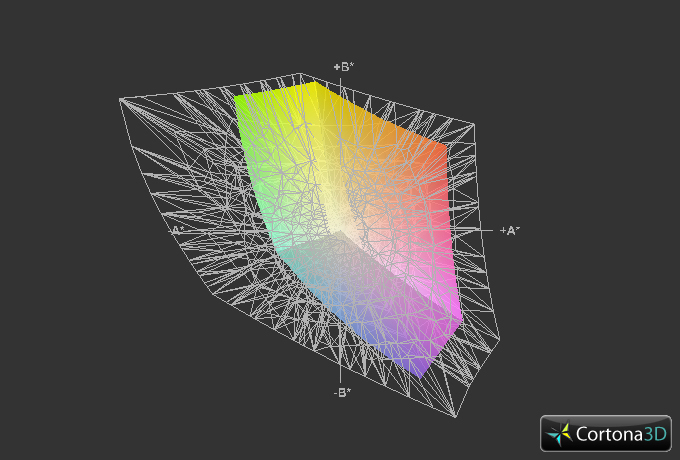 The displayed images can even be recognized from the sides (almost 180 degrees), although they are somewhat darker. 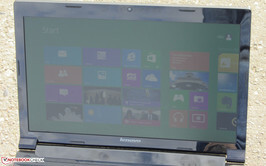 The Lenovo B580 outdoors (pictures taken with sunshine). 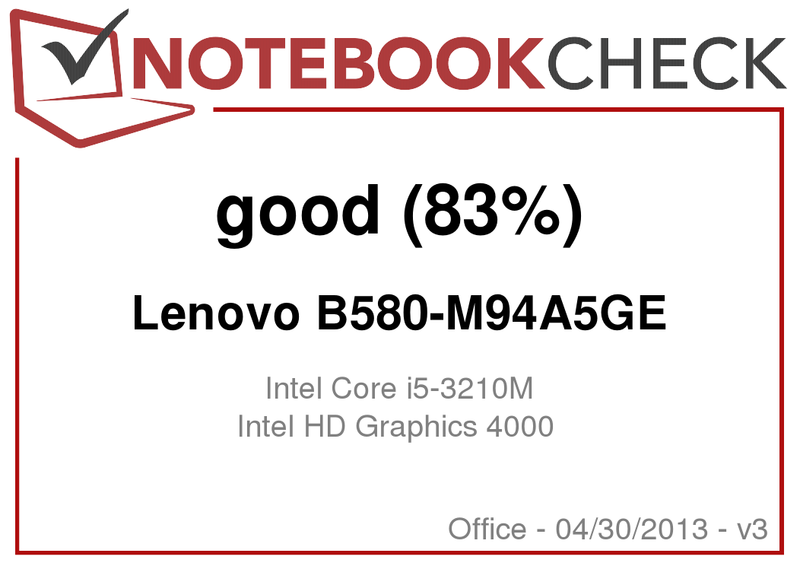 Lenovo is providing an affordable workhorse notebook for private or business use with the B580, and thanks to its powerful Core i5 processor, it fares well in most disciplines. Internet browsing, office use, video playback - none of these pose a problem. 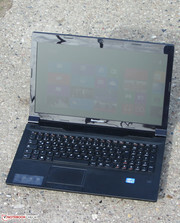 At present, the price for the notebook stands at about 500 Euros (~$647). A second variant with about eight GBs of RAM costs approximately 20 Euros (~$26) more. In addition to this, we were also able to find a model with a Core i3-3110M processor and a 750 GB hard drive. Other models from the B580 series are not available in the German market as far as we were able to determine. 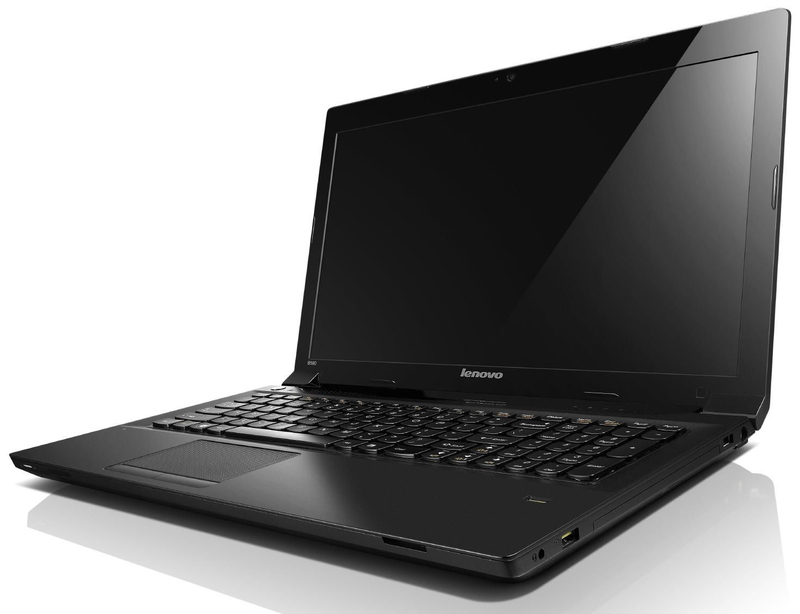 Anyone wishing to have a broader range of options to choose from could fall back on the Lenovo B590 series. In this case, the devices are practically identical, and we have already taken a closer look at the B590-MBX2JGE. As things stand there are many different versions available, with the primary differences being the processor (from a Pentium to a Core i5), the hard drive and RAM capacities, and the operating system; whereby the cheapest model from the B590 series (Pentium B960, two GBs of RAM, 320 GB hard drive, without operating system) is currently available from about 300 Euros (~$388). The B580 is equipped with an Intel Core i5-3210M dual-core processor. The processor is a descendant from the Ivy Bridge generation of processors and operates with a base clock speed of 2.5 GHz. With the aid of Turbo Boost, the speed of the two processor cores can be increased to up to 2.9 GHz, or the speed of an individual core can be increased up to a maximum of 3.1 GHz. The CPU tests carried out with the Cinebench benchmarks are completed with the processor operating at 2.9 GHz throughout. The ProBook (AMD A4-4300M, Radeon HD 7420G) is meanwhile outperformed by both candidates since it contains the weakest of the CPUs, while the results achieved by the ThinkPad Edge (Core i5-2450M, GeForce GT 630M) still lag behind those from the B580, even though it also contains a Core i5 processor with a clock speed of 2.5 GHz. The reason for this was quickly determined: The processor is based on the Sandy Bridge generation, and therefore delivers approximately five percent less performance with an identical clock speed. In addition to this, the Turbo Boost speed of both cores is also slower at 2.8 GHz. During the GL tests with Cinebench R11.5 the results led to a clear-cut conclusion. The ThinkPad Edge is the clear winner in this discipline, and the B580 comes in last behind the 4545s. The ProBook on the other hand delivers the worst results in the GL test with Cinebench 10. Essentially the B580 works relatively fast and seamlessly. Nevertheless, the starting of Windows drags on for quite a while. The reason for this can quickly be put down to the diverse software programs that are loaded when booting up, which should be uninstalled in case they are not needed. The results from the PCMark 7 benchmark turn out to be good, while those from the ThinkPad Edge (Core i5-2450M, GeForce GT 630M) and the ProBook (AMD A4-4300M, Radeon HD 7420G) lag behind those achieved by the B580. By adding a second RAM module (with the RAM operating in dual-channel mode), the results of the two PCMark benchmarks were improved by almost 4% to 2639 points with PCMark 7, and 6% to 5880 points with PCMark Vantage. A noticeable improvement was also observed after the included hard drive was exchanged for a second hand SSD (Corsair Nova V32 - 32 GB), whereby the PCMark 7 benchmark results increased by about 46% to 3706 points. 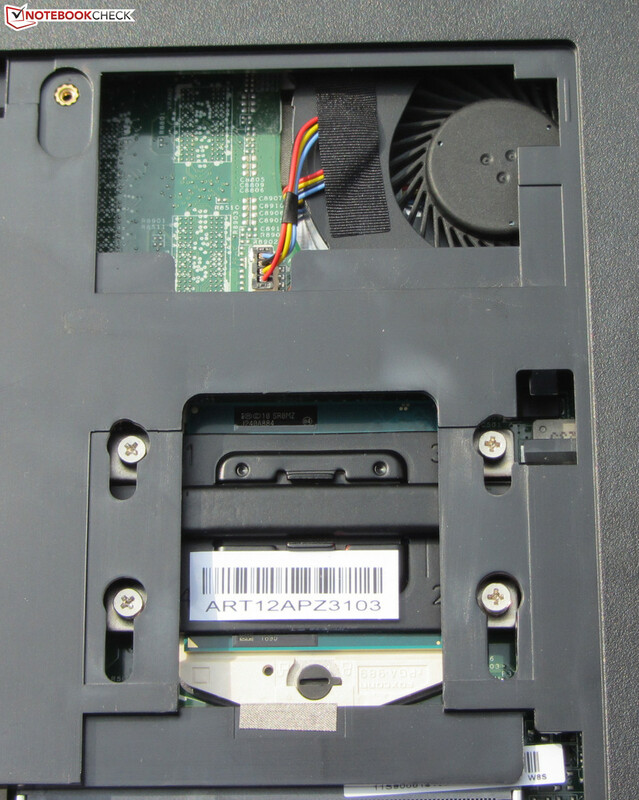 In a scenario where the available mSATA socket would be used to fit an appropriate SSD, this would also improve the performance of the B580 significantly. The hard drive included with the Lenovo B580 is a Seagate Momentus SpinPoint M8 Series with a capacity of 1 TB that rotates at a speed of 5400 revolutions per minute. CrystalDiskMark measured a read rate of 105.5 MB/s, while HD Tune ascribed an average data rate of 76.8 MB/s. These values are quite decent for a 5400-rpm hard drive, especially considering that the notebook is primarily aimed at users that intend to use it for office use - privately or for business. A large amount of storage capacity is not generally a requirement in this case though, which is why the B580 would probably have been better served with a faster Solid State Drive. The graphics processing requirements of the B580 are fulfilled by the integrated Intel HD Graphics 4000 GPU, which supports DirectX 11 and operates with clock speeds of between 350 and 1100 MHz. During the various 3DMark benchmarks the ThinkPad Edge (Core i5-2450M, GeForce GT 630M) clearly leads the pack with its GeForce GPU, while the ProBook (AMD A4-4300M, Radeon HD 7420G) and the B580 are more or less on an even par. The B580 certainly is not the ideal choice for gamers, although the graphics solution from Intel is able to present some current 3D games with a low resolution and quality settings reasonably smoothly. Even comparatively leisurely games such as FIFA 13 can be played with the native resolution and medium quality settings. The frame rates can also be improved marginally by the addition of a second RAM module. 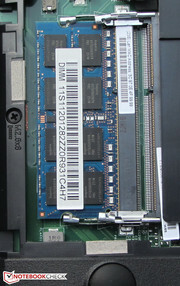 In this case, the RAM operates in dual-channel mode, as a result of which the HD Graphics 4000 GPU is better utilized. Thus, we were able to increase the frame rates for the game Tomb Raider by 31% (low) or 23% (medium). The game Starcraft 2: Heart of the Swarm meanwhile delivers about 19% faster frame rates. If the ability to play games smoothly is a decisive factor for the purchase of the notebook, then the B580 probably is not the right choice. Notebooks that would be better suited in this scenario would be the Aspire E1-571G (Core i3-3110M, GeForce GT 620M) or the Packard Bell EasyNote TS11SB-250GE (AMD A8-3520M, Radeon HD 6620G + Radeon HD 7670M). Both of these are able to present most current games smoothly, and are even somewhat cheaper than the B580. Also the ThinkPad Edge model tested by us is a gaming capable notebook, although it is significantly more expensive with a price upwards of 600 Euros (~$776). The B580 is certainly the quiet type. Across the whole performance spectrum, the notebook remains remarkably quiet throughout. In an idle state, we measured a system noise between 31.8 and 31.9 dB(A). The ThinkPad (30.7 to 31.9 dB(A)) meanwhile is slightly quieter, while the ProBook (32.5 dB(A)) is a little bit louder. With a medium processing load (3DMark 06 running) or while fully utilized (stress test, Prime95 and FurMark running) the noise levels from the B580 however only increase to 31.4 and 33.2 dB(A), while the Edge E530 (36.4 and 38.1 dB(A)) and the ProBook (32.5 and 34.6 dB(A)) start to break their silence. The loudest system noise was generated as a result of using the DVD drive, where the noise level increased to 36.5 dB(A). The Lenovo B580 during the stress test. The B580 does not get excessively warm in an idle state, with temperatures measured by us remaining in the range between 25 and 33 degrees Celsius (77 and 91.4 Fahrenheit). With the maximum processing load, the temperature range increased to 24.8 and 43.6 degrees Celsius (76.64 and 110.48 Fahrenheit), whereby the maximum temperature in excess of 40 degrees Celsius (104 Fahrenheit) was measured in the area around the cooling vent. The ThinkPad Edge and ProBook meanwhile do not get quite as hot as the B580, and the ProBook in particular proves to be considerably cooler than its counterparts. The full processing power is available both when mains and battery powered, and during the stress test (Prime95 and FurMark running for at least an hour) both the CPU and the GPU worked at their maximum capacity throughout (GPU: 1.1 GHz; CPU: 2.9 GHz). The temperature of the CPU settled at around 67/68 degrees Celsius (152.6/154.4 Fahrenheit) when mains powered. 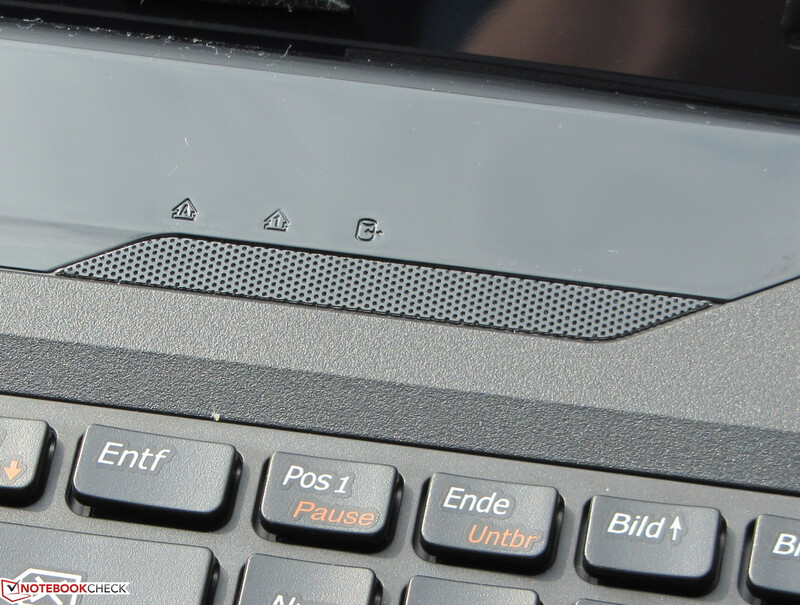 The stereo speakers in the B580 are located above the keyboard behind two perforated plastic covers. They generate a reasonably rounded audio quality, even though bass frequencies are not reproduced, but considering that they are intended for office use, they should be more than adequate - we have certainly heard worse. For a better audio quality we would recommend using external speakers or a pair of good quality headphones. During idle state the B580 proves itself to be reasonably frugal, with a power consumption of between 6.5 and 10.6 Watts. The ThinkPad Edge (9.3 to 12.4 Watts) and the ProBook (7.6 to 12 Watts) have somewhat more of an appetite. 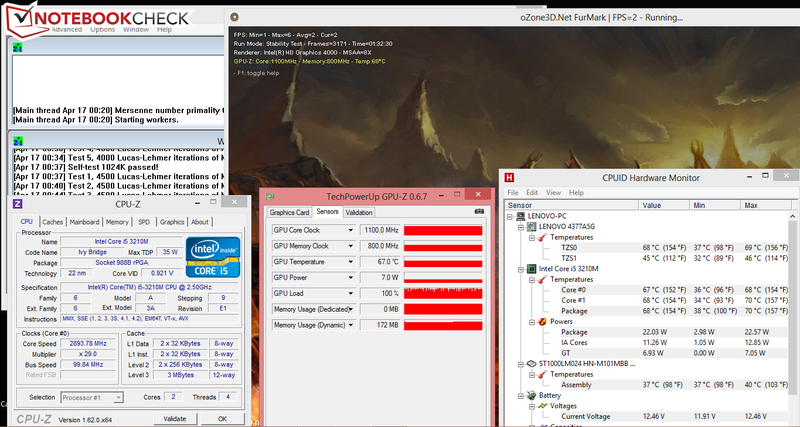 Also with a medium processing load (3DMark 2006 running) and while fully utilized (Prime95 and FurMark running), the B580, with 30.7 and 41.1 Watts, is more economical than the ProBook (37.3 and 42.9 Watts). The difference compared to the ThinkPad Edge (63.1 and 53.4 Watts) meanwhile turns out to be considerably bigger, primarily due to the GeForce GPU it contains. In an idle state the B580 reaches a battery runtime of 8:01 hours, with the ProBook holding out for slightly longer with 8:41 hours, and the ThinkPad Edge running out of steam after 6:41 hours. These results were determined by the Battery Eater test, which tests the maximum runtime with the display brightness set to its minimum, the power-saver profile active and wireless modules switched off. With a high processing load the battery life meanwhile only lasts for 1:21 hours. In this case the ProBook (3:32 hours) lasts just over two hours longer, and the ThinkPad (1:05 hours) once again has the least endurance. The WLAN test ends after 4:31 hours with the B580. In this case, the order of the notebooks remains the same, with the ProBook lasting for 4:41 hours and the ThinkPad Edge lasting for 4:03 hours. During this test, a website is automatically reloaded every 40 seconds, with the power-saver profile active and the display brightness set to about 150 cd/m². Playing back DVDs is possible with the B580 for 3:39 hours, while the 4545s (4:25 hours) lasts almost an hour longer, and the E530 (3:11 hours) falls behind marginally. 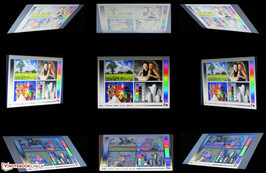 The DVD test was carried out with the power-saver profile active, the display brightness set to its maximum, and with the wireless modules switched off. 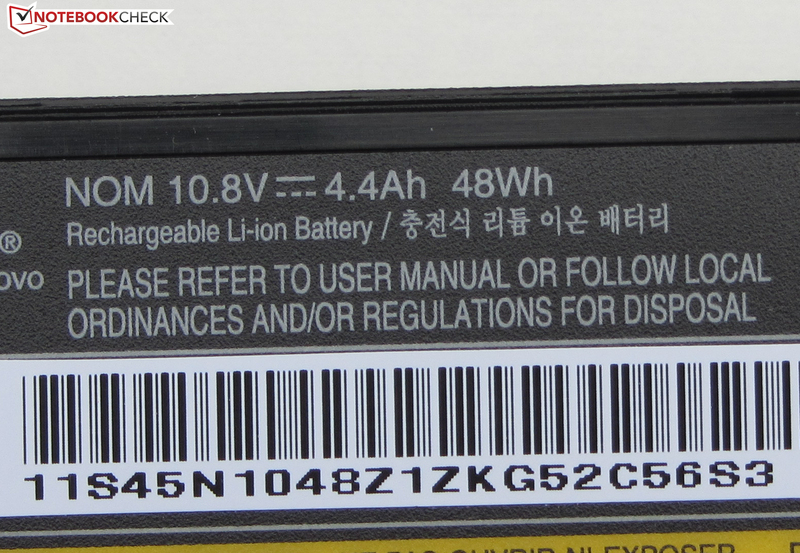 The battery runtimes of the three devices can easily be compared, since the batteries have similar capacities (Lenovo: 48 Wh, HP: 47 Wh). 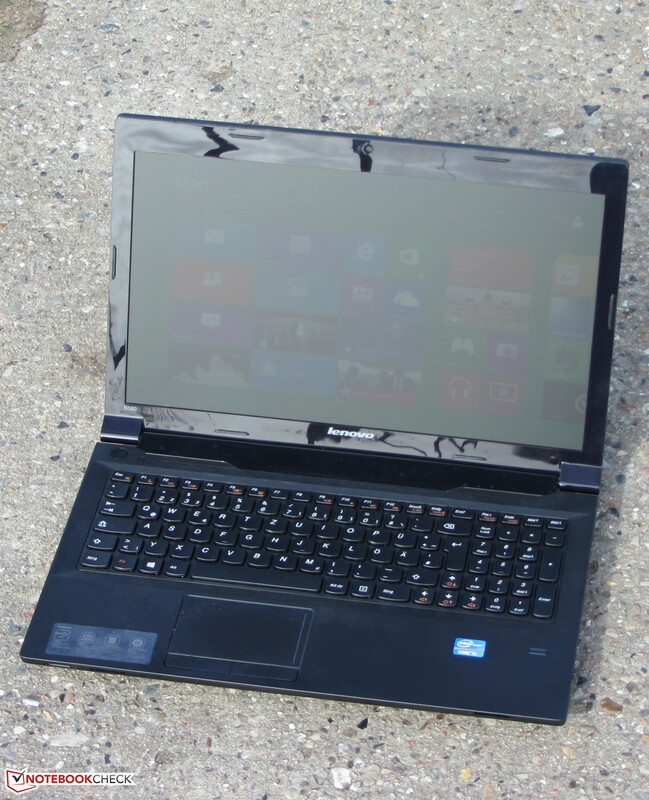 All in all the Lenovo B580 is able to make a convincing impression as a work notebook. It provides a pleasant application performance and remains quiet at all times. In addition to this, it is also equipped with a good keyboard, and has acceptable battery runtimes. Furthermore, the display contrast is higher than when compared to many comparable notebooks, and the amount of storage capacity is also quite good. However, these characteristics may be secondary priorities for a work notebook. 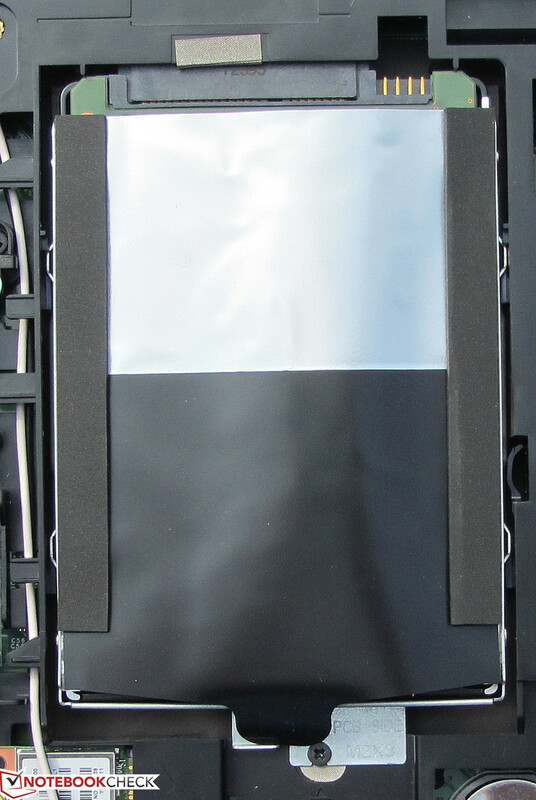 In case an upgrade to a Solid State Drive is intended, then the available mSATA socket allows the included hard drive to be kept as well. Two aspects of the notebook that stand out as possible areas of criticism are the low display brightness and the quality of the case. The HP ProBook 4545s is a likely candidate in cases when a long battery life and a high quality case are a priority, while the Lenovo ThinkPad Edge E530 would probably be the first choice if playing current 3D games is a necessity thanks to the GeForce GPU. At present, versions of the Edge E530 are no longer equipped with the GeForce GT 630M GPU as was the case with our reviewed model, but instead with the GeForce GT 635M. 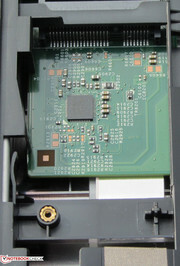 Access to the BIOS battery is also possible. The cooling fan is partially accessible. 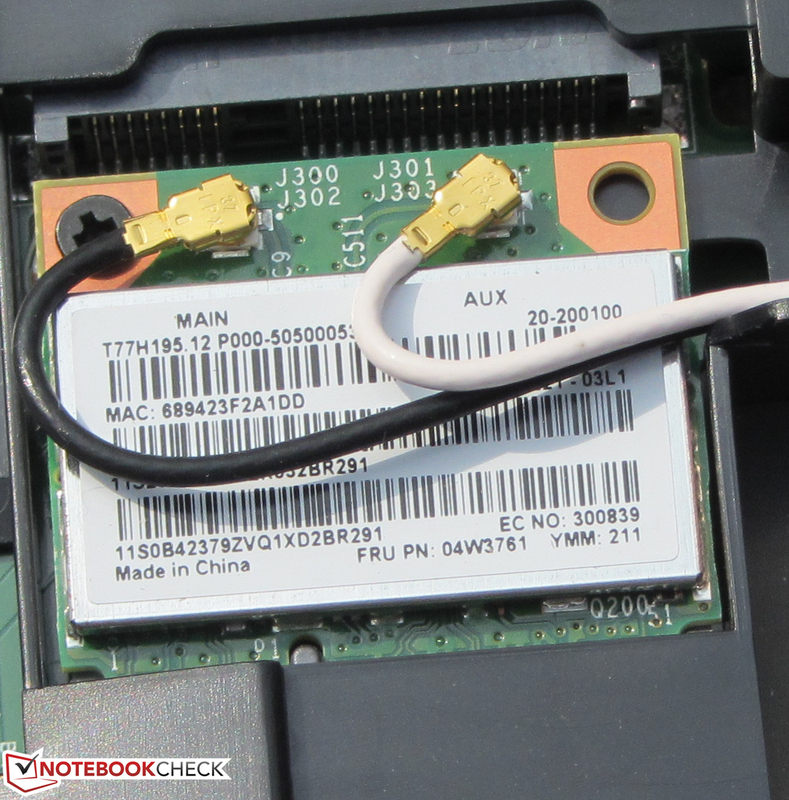 We were able to change the hard drive without any problems. Two RAM banks are available. With the maintenance panel removed. The speakers are located above the keyboard next to the status LEDs. 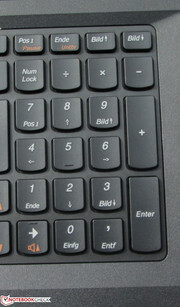 A numeric keypad is also available. The hinges allow the display to wobble a little bit. The DVD burner is compatible with every kind of DVD and CD. 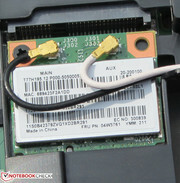 The mSATA socket allows the notebook to be upgraded with an SSD. 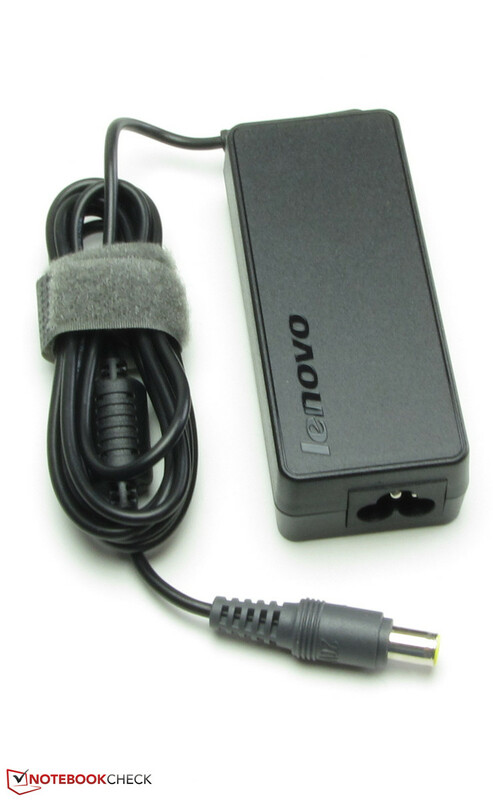 ...and provides a capacity of 48 Wh. ...and delivers a maximum power of 64 watts. The keys have a concave surface. The back of the display has a fine pattern. A fingerprint reader is also available. The B580 is always quiet. In addition to this it also provides a good application performance. The display could be a bit brighter. 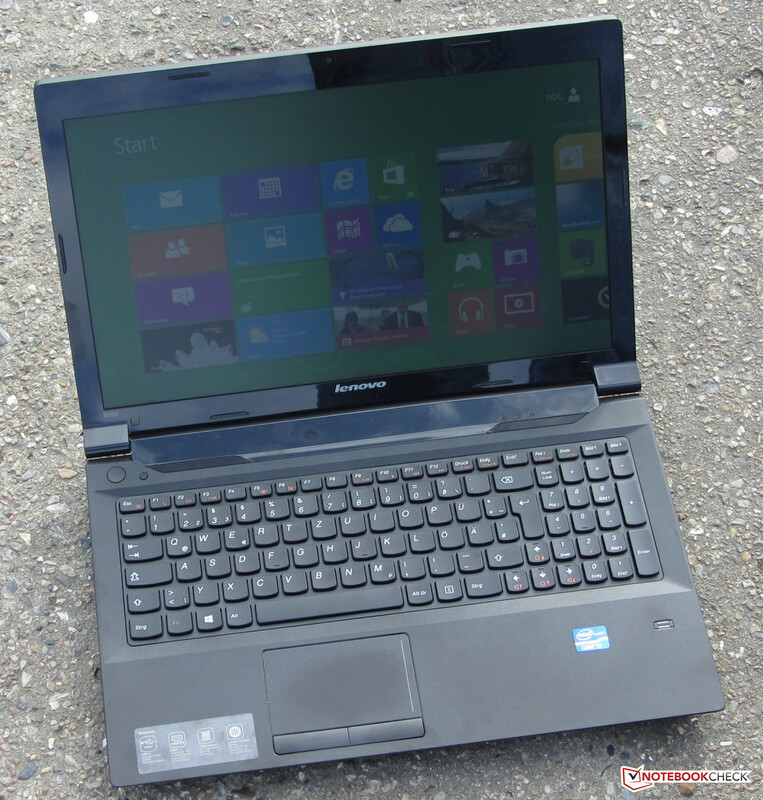 Lenovo is providing an affordable notebook that fares well in many categories.